NOTES: One of Frog's last kits. The Bearcat followed the Wildcat and the Hellcat and was specially designed to outperform the Japanese Zero fighters. First flown in June 1944, it was just too late to see service in World War 2, but nevertheless became a most successful plane with the U.S. Navy and Marines. It had a large four-bladed propeller and this, together with a very powerful engine and a relatively light-weight airframe, gave the Bearcat a sensational performance despite its stubby appearance (thanks to the kit supplied history). In addition to US service, it was well-used and liked by the French in their colonial war in Indochina and 25 survivors were passed on to the fledgling South Vietnam Air Force to equip the 1st Fighter Squadron. The only other foreign user was another Southeast Asian country; Thailand. This nation received a total of 129 1/1Bs to equip its 1st and 2nd Fighter Bomber Wings. 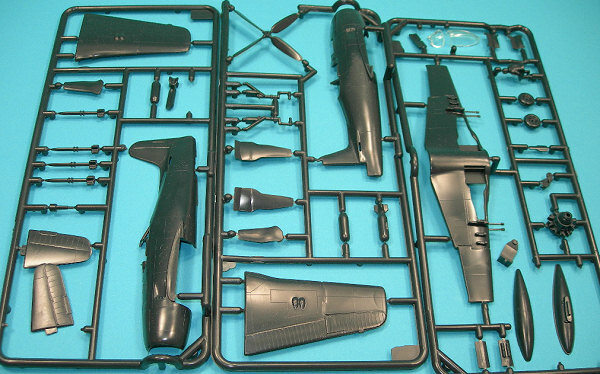 This cleanly molded kit has a surface that features very petit raised panel lines with only the control hinge and wing-fold lines being engraved. As one should expect, the cockpit is very basic with pilot, seat (it does have the headrest), partial floor (just enough to hold the seat), roll-over bar molded to the fuselage and a partial instrument panel molded under the coaming. While basic, with the very small cockpit opening, pilot in place and the two-piece canopy (thick but clear) closed, the void would look busy enough. Frog offers a separate engine that only has a single row of cylinders, but this abbreviated engine will be partially hidden in the tight cowling and behind the nice and thinly molded but wide propeller blades. Frog was more generous with external stores as a fuel tank is enclosed for the fuselage station and the wings three molded-on pylons carry two 4.5 rockets and a single bomb. Another option with this kit is that two sets of landing gear doors are offered so that this model can be displayed in flight or static. All the gear doors capture the original shapes quite nice and would look good with just a little thinning. The Bearcat featured a robust landing gear and kit molding fits the bill and the main tires feature well done hub detail. One niggly with the lading gear is that the wing wells are only partially framed in while the tail well gets a proper bay (if a little shallow). Assembly instruction are well drawn and clearly illustrated though you are on your own for interior colours. There were some things about FROG kits that I truly appreciated besides the subject matter. 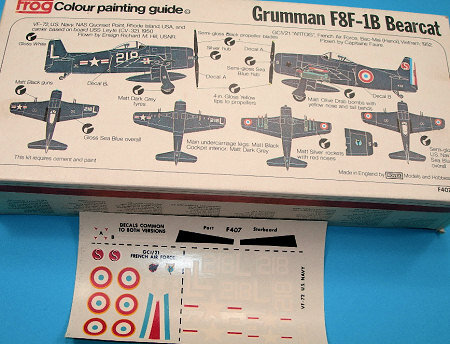 They gave at l east two decal options and their decals were the best available at the time and these options were illustrated in glorious full colour on the back of the box (or header card). Both Bearcats for this boxing are in overall US Navy Sea Blue. The first aircraft belongs to Ensign Richard M. Hill of VF-72 that was shored based at NAS Quonset Point, Rhodes Island or at sea on USS Leyte. Indochina (Vietnam) was the home base for the French Air Force option and this was flown by Captain Faure of GC1/21 “ARTOIS”. This is the more colourful option with the classic French full-colour rudder and different insignia for each side of the cowling. While this is a nice looking kit with decals that still look great, it is the fact that it is perhaps the third-last kit issued by FROG (December 18, 1975) that makes it worth acquiring and keeping.